FIRE EATERS, FRIENDS, LADIES, ASSOCIATES, GUESTS, PROSPECTIVE MEMBERS, LEND ME YOUR EARS, or possibly your wallets, purses, money bags. Anyway, pay attention to this fantastic announcement all ye who await a transcendental experience and be advised of what you can anticipate upon your participation in this unique performance never allowed to be provided in the United States until now, through the diligent efforts of your 1st Lt. Commander. EVERYONE BE HAPPY. There is joy all around at the prospect of a rousing Fire Eater meeting this coming Wednesday, August, 2, 2017 at Bass Pro Shops near Ashland on Lakeridge Parkway. Joy, happiness, excitement, ecstatic passion, cheerfulness, rapture, gladness, bliss and pleasures beyond anyone’s imagination await all who attend the upcoming Fire Eater meeting on August 2. MESSAGE TO THE VIRGINIA GOVERNOR, LT GOVERNOR OR ATTORNEY GENERAL to protect the sanctity of our proceedings, and particularly this month’s event filled meeting. All is well and we are excited to bring this festive evening for your enjoyment and delight. After the World Famous Happy Dance to be performed by a Compatriot, whose identity will not be revealed, to protect the guilty, all attendees are invited to participate in individual Happy Dances of their own, which shall be judged by the Commander, whose decision is final. Then it is on to the Conga Line Dance throughout the Bass Pro Shops continuing until 9:00 p.m., with liquid refreshments, including adult beverages available in the parking lot for a nominal fee. Your happiness, joy, cheerfulness and delight are our only desire. WELL, ON THE OTHER HAND, maybe we can squeeze in a brief presentation by our Keynote Speaker for the evening, Bob Krick, who will speak to us about the Generals involved in the Defense of Richmond. His presentation involves a lot of local history around Hanover County, so we may need to shorten the Conga Line. ACTUALLY FOLKS, here is the Real Deal: Meet at the Bass Pro Shops between 5:00 p.m. and 6:00 p.m. to enjoy good fellowship and a meal in the Restaurant. Then on to the Business Meeting and Keynote Speaker upstairs in the meeting room at 7:00 p.m.
Bring your friends, neighbors and family members to this August 2, 2017 meeting of the Edmund Ruffin Fire Eaters at Bass Pro Shops. Bring your happiness, your joy, your excitement, and you will not be disappointed. All is well, all is peace, all is tranquility. And all hell will break loose on August 2 with passion, rapture and bliss, to mention a few of the benefits of attending this special meeting. BE THERE. Chairman Jim Tingle and member Herb Carver removed a small tree from atop grave markers in Confederate section (D) also picked up trash in Confederate section (A) as well as give assistance to two ladies from Georgia looking for a Confederate ancestor. The July edition of The First Shot is ready. Get Your July 2017 Edition of The First Shot here! Members of the Edmund Ruffin Fire Eaters Graves & Monuments Committee came together this morning to remove a fallen tree limb from Edmund Ruffin’s grave site. 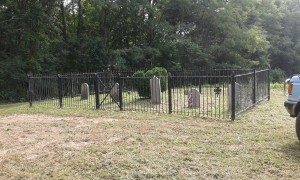 There was no damage to the fence however, Edmund Ruffin’s headstone was damaged, but can be repaired. We reset Mr. Ruffin’s marker so as to prevent further damage. We hope to repair it soon. 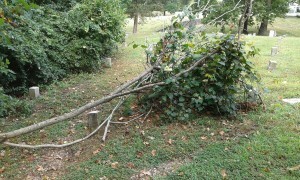 We also set another headstone that was atilt caused by the fallen tree limb. We mowed and trimmed the grass. Thank you Tim Tuck, Charles Martin, Bill Cuneo, and Herb Carver for volunteering to join me in preserving and maintaining this historic landmark. 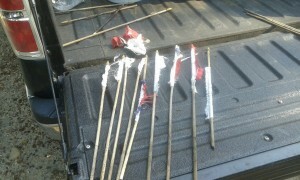 7/13/2017 Oakwood: Vandals ripped the flags off from more than 50 stick flags that were placed on the graves of our Confederate veterans. What you see, in the photo, here is just some of the damage that was was done. Herb and I were able to replace a majority of the flags that were vandalized, but ran out of flags so were unable to replace them all. Members of the Edmund Ruffin Fire Eaters camp 3000 Graves & monuments committee, went to the family grave site of Edmund Ruffin to clean headstones and replace tattered and or fadded flags. 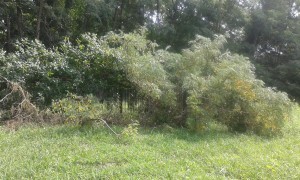 Upon their arrival and to their dismay a large tree limb had fallen across the fence that borders the grave site. 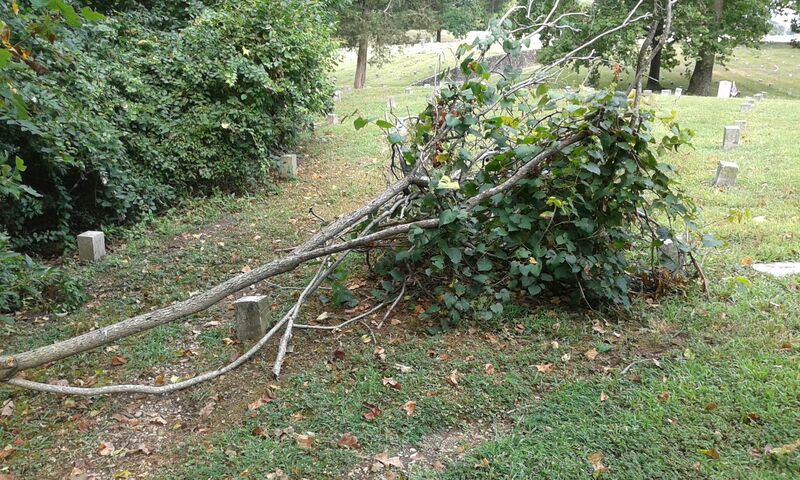 The damage, if any, to any of the headstones can not be determind until the limb is removed Tuesday July 18 , 2017. We will have the equipment and volunteers on site at that time. Did you realize that 2017 is almost history? Think about it…the days are already getting shorter and 2017 is over have over already! Can you believe it? Well don’t panic; we have a solution for you that will allow you to sit back, relax and enjoy good fellowship and reacquaint yourself with your Southern Compatriots. 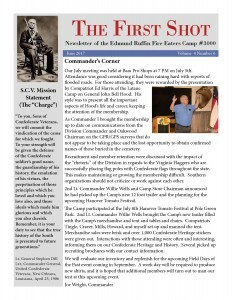 IT IS CALLED THE JULY 5, 2017 EDMUND RUFFIN FIRE EATERS CAMP #3000 MONTHLY MEETING AT THE BASS PRO SHOPS ON LAKERIDGE PARKWAY SOUTH OF ASHLAND (EXIT 89 FROM I-95. This month our guest speaker is Ed Harris, who will be speaking on John Bell Hood. Ed comes to us through the recommendation of John Henry Taylor. As usual, we will have a large central table in the Restaurant for any and all who want to socialize before the formal meeting. So gather around the table at 6:00 p.m. (1800 for you military types) to meet, eat and greet. If you prefer, there are a number of other restaurants in the Ashland area, but the Almadora Restaurant is convenient to our meeting space. Regular meeting starts at 7:00 p.m. (1900) in the upstairs meeting room. We need to get everything straight for the upcoming Tomato Festival, so come on down to see what is planned. The Camp has not had any controversy since the Camp Corvette and Camp Harley fiasco, and I love a good controversy. Therefore, I urge you to please submit your ideas for a great Camp Controversy to me, so we can see if anyone can get something together that will result in charges being brought this time. Have fun on July 4th, and get your bad self out to The Bass Pro Shops for our monthly meeting on July 5 at 6:00 p.m. P.S. : There is absolutely no truth to the rumor that the Stafford County Sheriff’s Swat Team surrounded my residence in an effort to repossess the Camp Corvette. Don’t believe it, whatever inaccurate, incorrect and blatant falsehoods the liberal press prints about this alleged incident!